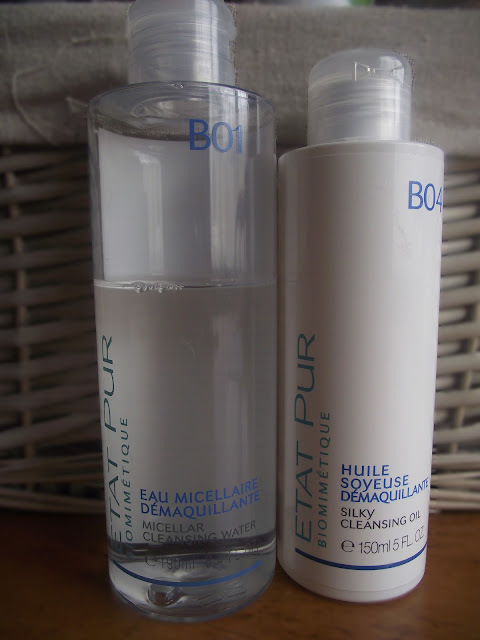 Beauty In The Mirror: ETAT PUR- Micellar Cleansing Water dupe for Bioderma Sensibio? ETAT PUR- Micellar Cleansing Water dupe for Bioderma Sensibio? I've been trying a couple of new cleansers recently and feel I've given them a good trial and wanted to share my thoughts with you. I'm sure most if not all of you have seen, heard and read rave reviews about the Bioderma Sensibio H20 water which is suppose to be the holy grail of eye makeup removers. Well the creator of Bioderma & Institut Esthederm has developed a new skincare concept called ETAT PUR. Available in the UK yep heads up ladies I think you'll want to carry on reading when I mention the 'Micellar Cleansing Water'. Now first things first, I can't comment on the Bioderma Sensibio H20 water because I've not tried it *yet* however after reading about it on various blogs and also on their website I can't help but think that ETAT PUR Micellar Cleansing Water reminds me of it, I mean the fact that it's been created by the same creator as Bioderma does make you think doesn't it? So I set about checking the ingredients but sadly they are actually quite different. However none the less I still imagine them to be very similar, so if you've tried both of these PLEASE comment and let me know what you think. Anyway onto my thoughts... OK so as you can tell I've been using this for a few weeks now and have to say this is amazing. I only wish you could buy a bigger bottle but this is still a good size at 190ml and also good to travel with. Another good point to mention is the price, whilst it's hard to get hold of Bioderma in UK it can also set you back a few pennies on shipping etc. Where as the Micellar Cleansing Water only costs £6.40!! Yes you heard right ladies and gentlemen, £6.40!! I've been using this as my eye makeup remover and have been very happy with the results, it does take a little extra elbow grease removing stubborn mascara *coughs* (Clinique high impact curling mascara). Best results I've found is by simply soaking your cotton pad/ball with the Micellar Cleansing Water and then placing over your eye and wait for a minute and then gently sweeping away. Do this a couple times and then your eyes are clean and makeup free, which then leads me onto my next cleanser. The next step for me after removing my eye makeup is to remove my face makeup and I've been using the Silky Cleansing Oil to do this. I've tried this a handful of times and don't seem to be getting on with it, I think I'm a little clumsy with the initial application. I'm use to using a balm/cream texture so this is going to take a little getting use to but I'm really wanting it to work because I've been so impressed with the Micellar Cleansing Water. I have dry skin normally so I always tend to steer towards cleansers which are either a cream, balm or oil. This is a little smaller in size, a 150ml and costs £9.30 which again is a good price. So the moral of the blog post is- if you're wanting to try the Bioderma Sensibio Cleasning Water but don't live in Paris and don't have French friends or family and don't want to pay the Ebay prices I would recommend you try ETAT PUR Micellar Cleansing Water! You can purchase ETAT PUR online and guess what? You get free P&P on your first order and 3 FREE samples, so why not give the Micellar Cleansing water a try?